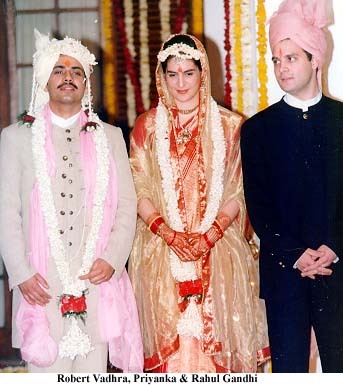 It was a most relaxed evening at 10, Janpath on February 18, when Priyanka, daughter, grand-daughter and great grand-daughter of three former prime ministers of India, got married to jewellery exporter Robert Vadra. After a two hour long Hindu ceremony around a fire with a dozen Kashmiri pundits present, Priyanka walked across to where her in-laws, Rajinder and Maureen Vadra, were sitting and bowed down to touch their feet. This was followed by an elegant dinner, both vegetarian and non-vegetarian. Not long after the dinner, the couple got into Robert's car and drove off to his mother's home in New Friend's Colony. Priyanka and Robert will spend a few days there and then leave for their honeymoon. The couple's government allotted bungalow at 35, Lodhi estate is not ready. Workmen from the Central Public Works Department are still carrying on with the required repairs. 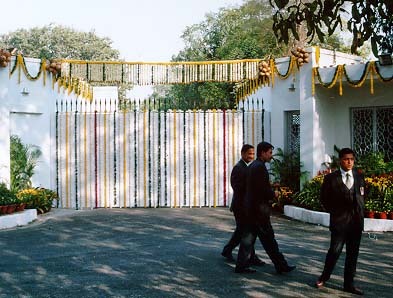 On their return to Delhi from their honeymoon, Priyanka and Robert will shift to the bungalow. She will thereafter design jewellery for Artex, her husband's firm. This is something she has been doing for the past months. Will Priyanka join politics? That is what it is-- still a question mark. 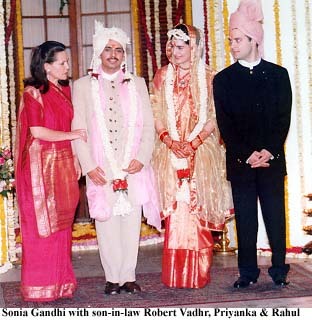 Both Sonia and Priyanka's brother Rahul were all smiles after the wedding. When the couple got into the car to leave 10, Janpath, Sonia asked some of the guests to give the vehicle a push. As in Hindu custom. Rahul accompanied the couple to New Friends Colony as part of the bidaai ceremony. Photographs and paintings of Rajiv Gandhi were on every wall at 10, Janpath. It was almost as if he was present to see his daughter married. 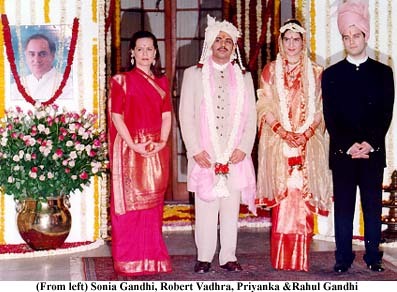 The bride wore a red south Indian sari, belonging to her grandmother Indira Gandhi. Her hands had mehendi. She wore a necklace, a chain, pendant and long earrings. For the rest it was flowers, flowers all the way. 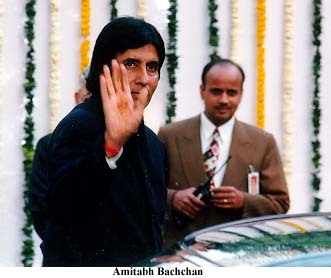 The guests included Prime Minister H D Deve Gowda, Congress president Sitaram Kesri, film star Amitabh Bachchan, his wife Jaya, their newly married daughter Shweta and her husband Nikhil Nanda, Captain Satish Sharma, the former Union minister, and his wife Sterre. Some of her grandfather Feroze Gandhi's relatives from Bombay were present as also members of Indira Gandhi's maternal family including former Union minister Shiela Kaul, her daughter Deepa and son Gautam, a senior Delhi police officer. Sonia's sister, her mother and an uncle were also present at the wedding.